If you haven’t heard of this next character before, you must have been living under a rock! 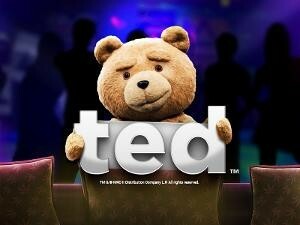 Ted has found his way into our hearts in his hilarious movie. Now thanks to Blueprint Gaming you can enjoy watching him forever, through this impressive slot game! Ted is a 5-reel, 20 fixed pay line slot that offers a cuddly 95.81% RTP to players. Set against what looks like Teds living room, the reels are full of graphics from the movie including Ted’s fave tipple, a swan, the bong and of course the lovely Lori. As the reels spin you will hear music from the movie and occasionally Ted himself talking away. Bet Amounts – Betting begins at 20p per spin and can be increased to a whopping £500 per spin. So be sure you have amended your bet accordingly before you hit that spin button. Wild Symbol – Ted is your wild symbol and he will substitute for all other symbols except the thunder buddies scatter. It is also one of the higher paying symbols of which there are two, the other being the Ted logo. Both of these pay 500x coins for landing 5 on a winning pay line, so watch out for both of those. Scatter Symbols – Your scatter is the thunder buddies’ words and landing three or more anywhere on the reels, will trigger the feature game. Ted Random Features – At random throughout the game Ted will awaken from his drunken stupor on the couch and you will see a random feature triggered as a result. Psychedelic Bonus Boost – once again Ted starts blowing smoking on the reels, revealing bonus symbols which will help to trigger the main feature! Thunder Buddies Bonus Feature – Once you have landed three or more of the Thunder Buddies scatter symbols, you will trigger this feature. You will be given a wheel of fortune to spin which will decide the feature you will play. Wheel of Fortune – on this bonus you will get the choice of selecting an image of Ted. This will reveal an arrow to move along the board or a multiplier boost for your stake amount. Or you can spin the wheel to try and enter the big money bonus round. Collect as many prizes as you can whilst the feature is in play. If you didn’t love Ted before you played this game, then we can be pretty sure you will love him now. With a range of random features and symbol triggered features, this game has many ways for you to win. Non feature wins are triggered very regularly within the main game and the big money prizes come quick and fast too. Combined with Teds sarcastic comments and quirky animations, makes this an interesting and amusing game.